Borussia Dortmund Sporting Director Michael Zorc has admitted that the club are monitoring the development of the best young players at Premier League clubs after Jadon Sancho’s impact in the Bundesliga. The 18-year-old has enjoyed a sensational start to the 2018/19 season, racking up 6 assists in the league despite starting only once in the Bundesliga for Die Borussen. In total, the London born winger has grabbed 1 goal and 7 assists in 10 appearances for Dortmund, having been on the pitch for less than 400 minutes. His incisive, intelligent displays on the flank in the early months of the season earned Sancho a bumper new contract that runs until 2022. Read More: Check out our dedicated Premier League page with match previews, predictions and free betting tips here. Sancho’s glittering performances also earned him a call-up to Gareth Southgate’s senior England squad for their games against Croatia and Spain and the youngster came off the bench to win his first cap against the former. His England call up was further vindication of Sancho’s decision to abandon the Premier League in search of first team football elsewhere. Sancho had been the crown jewel in Manchester City’s much-lauded and lavishly funded academy, but with his route to the first team blocked by bigger names, Sancho left England in the summer of 2017, signing for Borussia Dortmund for a fee believed to be in the region of £8m. 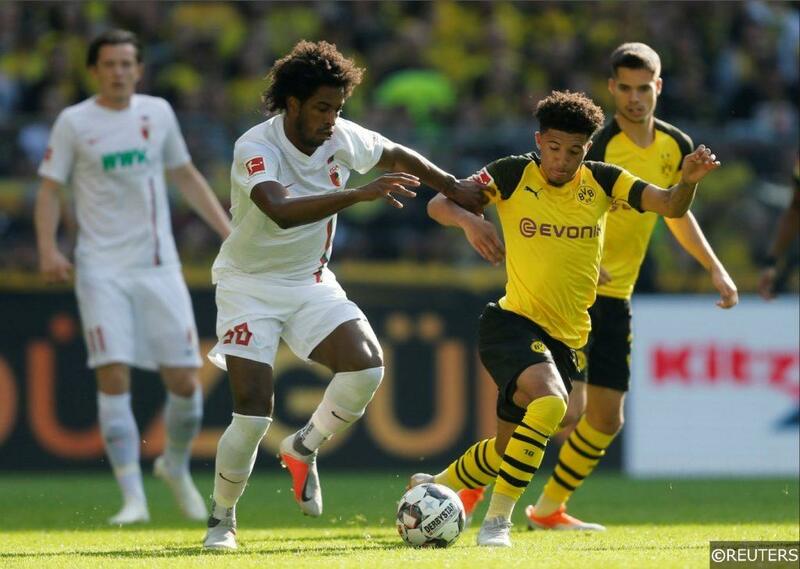 Sancho was handed the number 7 jersey by his new club, and though his appearances in the first team in his inaugural Bundesliga season were fleeting, they were undeniably impressive. In just 7 league starts in 2017/18, Sancho provided his Dortmund teammates with 4 assists. Sancho made 12 appearances in all for Der BVB, serving an apprenticeship that provided the foundation for his explosive start to the current campaign. With Sancho blazing the trail, Dortmund Sporting Director feels the time is right for others English players to follow. Michael Zorc believes that there are countless other highly talented young footballers in the Premier League aching for game time that they are unlikely to get in England’s top flight. “Until now it has nearly been out of the question for us to be able to transfer players from England to Germany,” he said. Borussia Dortmund have already been linked with moves for several other highly-rated English wonderkids, and with Sancho the poster-boy and shining example of the developmental benefits on offer in the Bundesliga, more potential world beaters could leave England for Germany. Read More: Could Harry Maguire be the face of the new £50 note? Who else have Borussia Dortmund been linked with? Dortmund are reportedly keen to reunite Jadon Sancho with his former City team mate and highly prized young midfielder Phil Foden. The 18-year old has been compared in style to Barcelona great Andres Iniesta, though he still finds himself on the fringes of the City first team. Foden has made 3 Premier League appearances from the substitutes bench for City this season, though Guardiola has thus far been reluctant to start the Stockport-born schemer. The more Foden watches on from the sidelines as Sancho tears it up in Germany, the more desperate he will be to get in on the action himself. Foden is expected to be offered a new 5-year deal by City, though with his current deal set to expire in 2020, he could look to explore other options. At just 15 years and 174 days old, Harvey Elliot became the youngest player ever to represent Fulham at first team level earlier this season, when he came on as a sub for the Cottagers in their EFL Cup match against Millwall. Midfielder Elliot is one of the most highly rated young players in England at present and Borussia Dortmund are believed to have registered an early interest in taking the player to Germany. Understandably, Fulham are said to been keen to resist any approaches for their potential superstar, though some of the bigger Premier League clubs are also rumoured to be monitoring developments. 21-year old centre half Jake Clarke-Salter has been in terrific form for Vitesse in the Eredivisie this season. The defender has been loaned out by Chelsea for three successive seasons now, first at Bristol Rovers, then Sunderland and now in the Netherlands. Clarke-Salter’s assured performances at the heart of the Vitesse defence are rumoured to have caught Dortmund’s eye. Clarke-Salter has been on Chelsea’s books since 2006, but having been offered so few first team opportunities, the stopper could be ready to continue his career elsewhere. Gifted creative midfielder Angel Gomes was Man Utd’s answer to Man City’s Jadon Sancho when the clubs came up against each other in the Premier League Academy system. With flawless technique and an eye for the spectacular, Gomes has been a standout player at youth level for United for years, though more recently his progress seems to have stalled. Gomes became United’s youngest ever Premier League debutant when he came on against Crystal Palace at the end of the 2016/17 season, though he hasn’t featured at that level since. Gomes is the same age as Sancho, and starred alongside the Dortmund star in England’s youth teams. With his career seemingly stuck in the mud at United and the German giants reportedly still keen on him, Gomes might be tempted to try his luck in the Bundesliga. Categories: Blog and Football. Tags: Borussia Dortmund, Bundesliga, Jadon Sancho, and Phil Foden. Team Tag: Borussia Dortmund. League: England Premier League and German Bundesliga. Sports: Football.